Fields are closed or opened at the discretion of the City of Port Coquitlam and the status posted on their website. Find current field status by clicking here. Status is updated by 8:00 am on weekends, and usually by 3:00 pm on weekdays. Port Coquitlam Euro-Rite FC field locations are listed below and marked on the map with the blue flags. For a more detailed map click on each of the parks in the list. 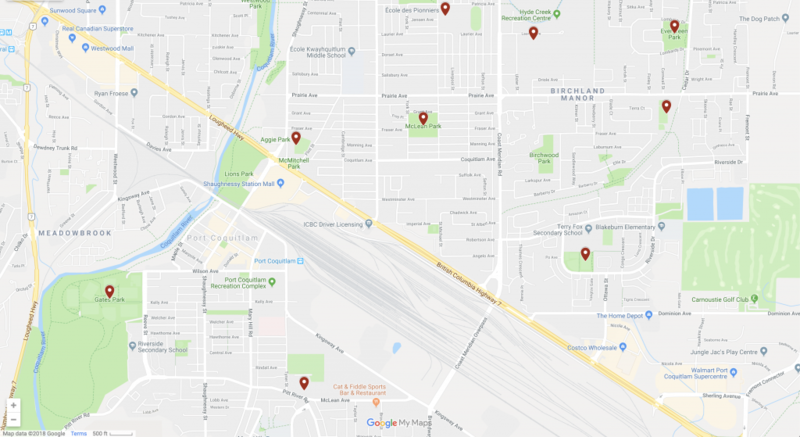 U5-U7 are generally played at the mini complex at Minnekhada, U8 are at EDP & U9-U10 are at Gates Grass 3A, 3B, 3C and most U11-U18 home games are played at Gates Park. Field use is controlled by the City of Port Coquitlam. Certain fields are only available to us for games, and some are not available at all. The City needs to balance all field user groups, as well as maintain the quality of the fields. All fields listed above are strictly OFF LIMITS unless schedule by the Club. Grass fields are NOT to be used for any training activities during the playing season (September to April). Grass fields can not withstand usage above that allocated for games. Additional usage from team training will result in damage fields, and thus increase the likelihood that the fields will not last the entire season. Fields are closed to prevent damage to the fields, and to protect players from injury. Fields will be closed when saturated from heavy rainfall, frozen or frost covered from cold temperatures, snow covered, or if previously damaged. Fields will be evaluated with a focus of keeping them usable for the entire season, not to allowing any one game to proceed. During the non-playing season (May to August) fields may also be closed to allow recovery, re-growth or repair. Any member of the club executive who has inspected/ evaluated the field condition may close a field. If fields are marginal they will be inspected on an individual basis, since conditions may vary from park-to-park. Since conditions may change throughout the day; regardless of the posted fields status, its is the ultimate responsibility of the referee to evaluate conditions before and during the game to ensure the field is not being damaged. Any decisions made by the referee with respect to field condition must be respected by all teams. Coaches are not to cancel games due to weather. When is this decision made? The City of Port Coquitlam will update field status by 8:00 am on Saturdays and Sundays. Mid-week closures can occur. Please check the City’s website during severe weather conditions. 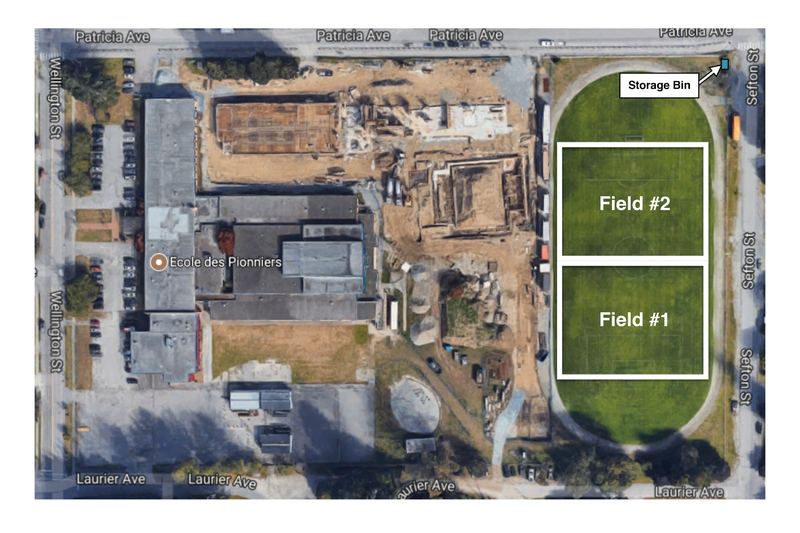 How will field closures be communicated? Closures are shown on the City of Port Coquitlam website. See below for their site. -Second time; The team will have training time suspended. -Fines may also be assessed by the City for violations- these will be passed along to the responsible teams.